Anyone who has learned about the fundamentals of content marketing knows the concept isn’t all that complicated – consistently provide something of relevant value to your target audience in the hope it will ultimately return the favor in kind. Serving the needs of your audience with valuable, high-quality content in this way is an admirable goal for any company. But of course, all your efforts will amount to little if your hopes go unfulfilled – if your content doesn’t trigger the audience behaviors that help your company reach its business goals. And that, my friends, is where the complications start to set in. Who specifically should our content be most relevant to? What benefits will this audience receive from consuming our content? What desirable and distinctive content experience can we consistently deliver? You’ll uncover the answers to these questions – and plenty of others – through the process of developing your content marketing strategy. 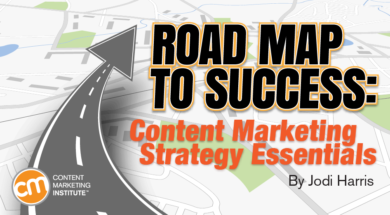 If you are new to content marketing – or to Content Marketing Institute – you may want to start your strategic journey by viewing our comprehensive Essentials of a Documented Content Marketing Strategy e-book, our Q&A guide on the topic, or our complete archive of strategy-related insights. For anyone looking for a refresher on the essentials or some help filling a knowledge gap, read on for a handy tutorial – and helpful resources – on the subject. While your company should certainly have a content strategy – a strategic plan for all its content usage across the enterprise – content marketers benefit from having a strategic road map that focuses exclusively on using content to attract, acquire, and engage prospects and customers. Why is it so critical to develop (and document) a separate strategy? For starters, consider that CMI’s annual Benchmarks, Budgets, and Trends research has consistently found a content marketing strategy to be the one thing that separates successful content marketers from their less successful peers. Furthermore, once you have a documented content marketing strategy, its insights can make all your tactical decisions easier to plan and manage. What’s in a content marketing strategy? Since these are complex considerations, I’ll unpack each one in more detail. Take a shortcut: If you’re strapped for time or resources but still want to put a more strategic content marketing framework in place for your organization, get a head start with this streamlined, one-page content marketing plan. As I mentioned in my last post, you’ll never reach your content marketing goals if you don’t know what you are looking to achieve. Since different types of content work better in pursuit of some goals than others, it’s important to clearly define success from your organization’s perspective first, so you don’t end up wasting time on efforts that don’t line up with what you want to accomplish. Brand awareness: Are you struggling to penetrate a new market, launch a new product, or compete with a high-profile market leader? Learn more about brand awareness content. Audience engagement: Do you need to raise your brand’s profile as a reputable source of information? Are you looking to attract social media influencers to evangelize your products? Learn more about using content to drive engagement. Website traffic: Are your ad campaigns failing to drive traffic to your e-commerce website? Are visitors immediately bouncing from your site pages? Are they failing to find the website information they need to drive their decision-making? Learn more about content that drives website traffic. Lead generation/nurturing: Is your sales team having trouble finding or qualifying new leads? Are they getting push-back in one area when trying to move existing leads down the funnel? Learn more about lead generation content. Increasing your marketing ROI: Are you looking for ways to reduce your marketing costs, increase sales, or open up new revenue streams? Learn more about focusing on ROI. Customer retention and loyalty: Is customer support receiving high volumes of calls? Are you failing to secure repeat business from consumers or upsell them on product options and add-ons? Learn more about driving retention/loyalty. Once you’ve identified your primary purpose for creating content, outline the goals you expect your content to help you achieve in that area. While each category offers different benefits, each is built on a common foundation of value – subscribed audiences. Why focus your goals around subscribers? As Robert points out, the deeper level of ongoing engagement that characterizes the subscriber experience makes this audience more likely to exhibit desirable behaviors – like a greater willingness to share personal data, a greater interest in upselling opportunities, or greater brand loyalty and evangelism – than non-subscribers. Learn more about setting your content goals. With your purpose and goals documented, you can move on to the next step in your strategy – finding the right audience to consume the content you create. Are there relevant yet underserved audiences who aren’t getting the information they need from other sources? What customer group is our business struggling the most to gain traction with? Can content help us bridge this gap? If we don’t provide content for this audience, would they care or notice? Can we become the leading information resource for this customer base? Learn more about pinpointing your ideal audience. Once you’ve identified your core customer, you’ll want to develop a clear picture of who they are so everyone on your team can get to know them as real people – with unique interests, goals, and challenges – and keep them top of mind when planning and creating your content. This is where your content marketing personas come in – composite character sketches of a type of customer based on validated commonalities. Personas help you understand how certain ideas, content formats, and approaches to the subject matter might make your audience more receptive to the content you share. Learn more about creating actionable content marketing personas. Take a shortcut: Don’t have time to gather the detailed information to develop a comprehensive audience profile? Hit the ground running with this process for hacking your buyer personas. You should also consider how your audience’s needs and behaviors may shift as your content does its job. Creating a map of your buyer’s journey helps you better anticipate and adapt to your persona’s content needs as they evolve. Once you know your audience, your purpose, and your goals, you have the information to develop the final component of your strategy: your content marketing mission statement. This is a brief declaration of your company’s unique content vision, the value that content provides, and the specific audience it benefits, along with the priorities and principles it upholds. As you craft your mission, CMI founder Joe Pulizzi recommends all content marketers ask themselves, “In what subject area can we become the leading informational provider?” If you don’t believe you can own the relevant conversations around the content niche you have chosen, you may need to narrow your focus to an area of content where you can have a bigger impact on the audience. Learn more about crafting your mission statement. Content Marketing Institute leads the industry in advancing the practice of content marketing for enterprise marketing professionals. We educate our audience through real-world and how-to advice through in-person events, online training, a print magazine, daily blog posts, and original research. Your content marketing mission statement should help your entire organization better understand what distinguishes your brand’s content experience from all the other content competing for your audience’s attention. Defining the core features of your brand’s differentiated story also helps your content team make more informed content creation decisions, as it is easier for them to see which ideas are well-aligned with your goals, and which ones may not serve your unique purpose. Learn more about finding the right differentiated story, or content tilt, for your brand. In my next post, I’ll dive into the steps you can take to activate your strategy, including your editorial planning processes, the roles and skills you will need to account for, and how to ensure that your team’s efforts will align with your strategy. Whether you’re getting started in content marketing or are an experienced practitioner, Content Marketing World offers something for you with over 100 presentations and speakers in multiple tracks on a wide variety of topics. Register today and use code BLOG100 to save $100.